The world's urban population is expected to increase by 60 per cent between 2014 and 2050, when 6.3 billion people are projected to live in urban settlements. New insights and solutions are urgently needed in order to manage the scarce resources that will be impacted by this trend, as well as operate new and regenerated urban spaces. New generations of sensor networks, Big Data analytics, and Internet of Things (IoT) applications are being deployed in public and privately managed physical spaces to meet these requirements, though many challenges remain. Municipal governments around the world are currently formulating their Smart City strategies, and now is the time to engage and learn from industry peers at the forefront of this key trend. 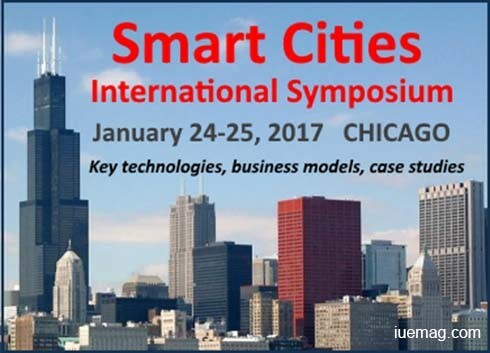 The Smart Cities International Symposium and Exhibition, January 24-25, 2017 in Chicago (www.smartcities-symposium.com) will bring together key thought leaders and practitioners from around the world to explore the most recent technology advances, business models, and lessons learned to date in making the Smart City a reality. The proceedings will focus on the experiences of municipal governments who are pushing the envelope and moving toward actual implementation of the Smart City vision. The emphasis is on implementation strategy, case studies, best practices, and the development of compelling business models for transitioning to the intelligent, connected city of the 21st Century. Michael Jansen, CEO and Founder,CityZenith Corp.